Henry Joseph Thielman was born in St. Cloud, Minnesota, on October 30, 1880. He attended Manhattan College and the University of Notre Dame. Thielman, an outfielder and pitcher, made his major league debut with the New York Giants on April 17, 1902. During his two years in the major leagues, he also played for the Cincinnati Reds and Brooklyn Suberbas. After retiring from professional baseball, Thielman completed two years of dental school at Philadelphia Dental College and then transferred to the University of Pennsylvania Dental School for his senior year. During his year at Penn, he was a member of the Kirk Dental Society and chairman of the cap and gown committee. 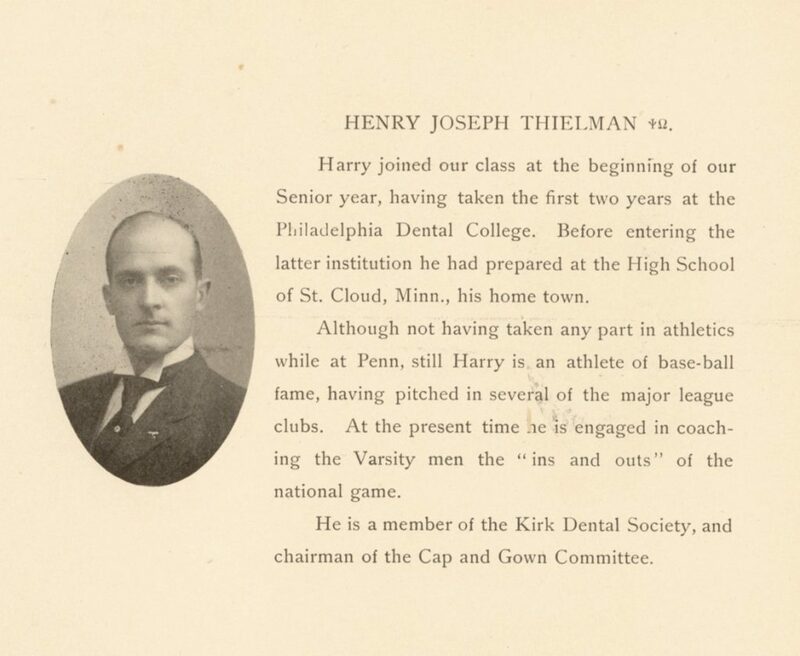 Although Thielman did not play baseball while at Penn, he was one of the coaches of the 1906 University baseball team. The other three coaches that year were John Blakeley, College 1895; F.W. Stites, Law 1904; and A.K. Dickson, College 1897. Thielman died on September 2, 1942, in New York City.